What does it take to support a four-story medical office building? It takes structural steel, and a supplier you can trust to deliver a quality product on time at a competitive price. 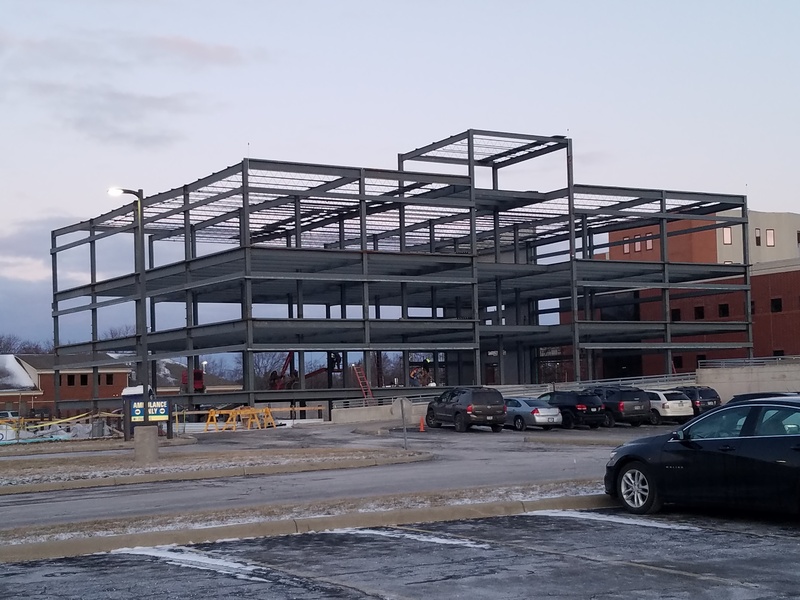 That’s why Swanton Welding felt honored when construction company Rupp/Rosebrock, Inc. selected Swanton Welding to help them create the new Fulton County Hospital Addition in Wauseon, Ohio. Rupp/Rosebrock, Inc. was tasked to build a strong, four-story, structural steel building. And it’s not just any building. This structure will be the framework of the future Fulton County hospital addition. The existing hospital building has not seen major construction for more than a decade. The hospital was simply out of room for its doctors to work. Swanton Welding was excited to assist Rupp/Rosebrock, Inc. by fabricating large pieces of structural members in Swanton Welding’s Structural Steel facility in Swanton, Ohio. We also fabricated additional support items like stairs and platforms. Steel frames are used in structures like this four-story building because of its strength, low weight, and speed of construction. Other advantages include its ability to easily create large span spaces, and its flexibility, which makes the structure good at resisting external forces such as wind. Work on the building began in August of 2017. Swanton Welding supplied all structural steel components for the project, including framing, stairs, handrails and deck. At Swanton Welding, we used our beam line to quickly cut and drill the beams for this project. The beam line has the ability to precisely locate holes and will etch the exact location for our fabricators to install the connection pieces. In addition, we fabricated the project in stages to coincide with our client’s construction schedule and needs. The amount of steel used weighed over 325 tons. The building will soon house 62,000 square feet of medical offices to better serve the community. Rupp/Rosebrock, Inc. will finish off the first three floors for medical offices. The fourth floor will be left open for future growth of the hospital. "[We] appreciate how Swanton Welding has put this project together from the shop drawing phase to delivery and schedule. Swanton Welding needs to be commended for a job well done." Swanton Welding is proud to be given the opportunity to support Rupp/Rosebrock, Inc. as they continue building this structure that will create more medical and wellness opportunities in Fulton County. If you are interested in learning more about Swanton Welding’s capabilities for your next structural project, contact us today for a free estimate.